Islamabad: Pakistan People’s Party (PPP) co-chairman Asif Ali Zardari on Saturday said that the whole nation had joint stance on Kashmir issue. 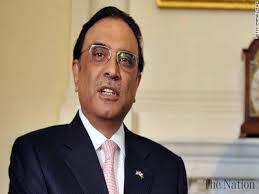 Addressing a conference in Islamabad, Zardari said that Pakistan and Kashmir are not separate. I am seeing independence of Kashmir in my life, he added. The former president said that Kashmir had suffered a lot due to dictatorship. He further sought media’s assistance to dissolve the government.